I have written of becoming a mother of God, through hearing the Word and obeying the Father. This is a great privilege, a holy labor, an abundant joy. Yet it is nothing like being the Mother of God, the Holy Virgin. I know that I shall never become like her – I am nowhere close. It has been said that Jesus told us that we can all be His mother and sisters and brothers because He wanted to make it clear that the essential relationship lie not in biological ties. Rather, the spiritual bond – the profound intimacy of being brought into Jesus’ union with the Father and the Spirit – is the true blessing. The reason I can say I will never be like the Holy Mother of God is because I will never be as completely obedient as she was, as completely giving of my entire self to God. I have already failed that test. And yet I do not despair. What is so incredibly beautiful is that we have been given Holy Mary to be part of our family too. Because of what she gave, she carried the Lord God within her – not just physically in her womb, but in the depths of her heart. She is “Theotokos” not just because she gave birth to Jesus in time, as incredibly important as that was, but because she brings Him to birth throughout time, in all parts of the world, in every race and culture. It is for this reason that we can rightfully portray the Madonna in art with any racial features – or rather with all racial features – because she is Mother of all. At one time, all of this seemed very strange to me and I had a difficult time understanding what seemed to me an almost cult-like devotion to the Virgin that I saw in some countries. And certainly, as with any matter of faith, there may be people who slip into the extremes, innocently or not so innocently, and for many reasons. But the Virgin Mary is given to us to help and protect us. We must never forget that the war of the spirit rages around us and within us – and we cannot fight it alone. The Theotokos has been given many designations that tell us how very important she is in our Christian life, e.g. Mother of Mercy, Help of Christians, Refuge of Sinners, Seat of Wisdom, Cause of Our Joy and Queen of Peace, among many others. The Holy Virgin has also been known by the places where she has appeared to humble believers. While some of these appearances may be controversial, some are utterly awesome in their nature and impact. Today (December 12), we in the Western Church celebrate one such appearance of the Holy Lady to a peasant named Juan Diego. The year was 1531, the place was Mexico. In the event that you are not familiar with the account (or would like to hear it again), I have narrated it and will reprint the text below, before commenting further. But on the following day, Sunday, the Bishop again did not believe Juan Diego and told him that some sign was necessary so that he could believe that it was the Heavenly Lady herself who sent him. And then he dismissed Juan Diego. On Monday Juan Diego did not return. His uncle, Juan Bernardino, became very ill, and at night asked Juan to go to Tlatelolco at daybreak to call a priest to hear his confession. 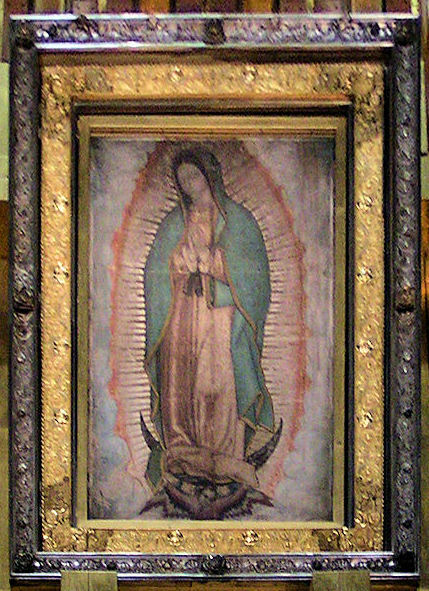 He immediately opened up his white mantle, and as all the different Castilian roses scattered to the ground, there was drawn on the cloak and suddenly appeared the precious image of the ever virgin Mary, Mother of God, in the same manner as it is today and is kept in her shrine of Tepeyac. There are a number of things about this appearance that are utterly amazing and deeply moving. One is that the “heavenly Lady” spoke to Juan Diego in his native language and insisted on speaking through this most humble but faithful man. The image she left of herself on his mantle showed her in Aztec clothing, using symbols that could be readily understood by the Aztec people. A shrine was built on the hill where she requested it and, within 7 years, approximately 9 million Aztecs were converted to the faith. The image she left has many remarkable qualities and it seems to be essentially indestructible. A strong nitric acid solvent was accidentally spilled on a large part of the image in the late 18th century and it “self-restored” over the next month. In 1921, a bomber placed 20 sticks of dynamite before the tilma in its glass case. Virtually everything around it was destroyed, including a marble altar rail, but the tilma and its case remained intact. Fascinating studies have been done of the image, revealing things that seem impossible – if we were not believers. For example, it has many qualities that are very much like a human body (it maintains a temperature of 98.6 F). However, more important than these fascinating details is that there is an enormously powerful truth among us. It is called the Kingdom of God. And its presence was made possible because one young woman, a humble virgin, said “yes” and gave all, out of loving obedience. She is our Mother. May we accept her loving help as we learn to be mothers of God, each in our own little way. This entry was posted in Uncategorized on December 13, 2015 by mary.